Here are seven important places or locations that mention huge biblical events. There is no greater event in all of human history than that which took place at Calvary and it was because of the great significance of what happened there that anyone could even be saved. This place is mentioned in Scripture as “Golgotha” and was known as the “place of the skull.” What was displayed there was the greatest demonstration of the love of God that humans will ever see. Nothing more impacted billions of souls than the atoning work of Christ on the cross. Jesus as the sinless lamb of God, died for sinful human beings in order to reconcile them back to God from a previous point of separation from Him (Isaiah 59:2). Three of the four writers of the Gospels mention Golgotha by name (Matt 27:33; Mark 15:22; John 19:17). This was a Greek word that meant “skull” and was commonly known to be just outside the city walls of Jerusalem. Most scholars believe it was called that because the features of the hill resembled a human skull. It’s quite possible that there were a few human skulls near there but that seems unreasonable to assume that’s how it got its name. Interestingly, we get our word “Calvary” from “the skull” because in Latin, “skull” (“calvāria”) is translated into “Calvary.” The cross is the fulcrum upon which all soul’s eternal destiny hinges. We can’t know about sin until we first see where sin entered into the human DNA. The Garden of Eden was not the first occurrence of cosmic treason against God. That infamous event is claimed by Lucifer and today is known as Satan or the Devil. He tried to overtake the throne of God because of His pride but was cast out of heaven because of his rebellion. That was the first sin in history…but mankind would get lots of experience in that area. As in Adam, we all sin (2nd Cor 15:52) and all fall short of God’s glory (Rom 3:23) but we can’t blame Adam or Eve as in believing that if we were there, we wouldn’t have done the same thing. Since then, we are all born into sin just as David writes under the inspiration of God, “I was brought forth in iniquity, and in sin did my mother conceive me” (Psalm 51:5). Job put this fact in a rhetorical question: “What is man, that he can be pure? Or he who is born of a woman, that he can be righteous” (Job 15:14)? The obvious answer is not even one is good (Rom 3:10). The fall and all that fell with it in creation will be restored someday but infinitely better than the Garden of Eden because God Himself will be present with us (Rev 21:3, 22:4). The tomb wasn’t left open so that Jesus could get out; it was left open so that eye witnesses could get in and see that it was empty. The tomb wasn’t left open so that Jesus could get out; it was left open so that eye witnesses could get in and see that it was empty. He was not there because He had been raised from the dead and this important event ties into our own bodily resurrection someday. 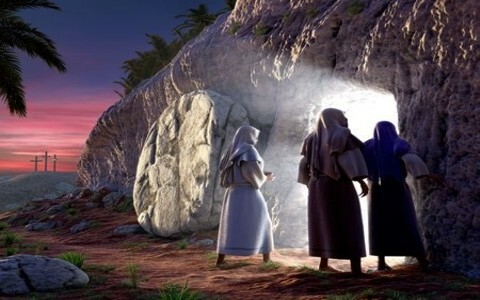 The Apostle Paul writes of the crucial importance of the resurrection by asking, “Now if Christ is proclaimed as raised from the dead, how can some of you say that there is no resurrection of the dead? But if there is no resurrection of the dead, then not even Christ has been raised” (1st Cor 15:12-13) and even worse, “if Christ has not been raised, then our preaching is in vain and your faith is in vain” (1st Cor 15:14). This is very bad news because “if Christ has not been raised, your faith is futile and you are still in your sins” (1st Cor 15:17) but it’s called the good news because “in fact Christ has been raised from the dead, the firstfruits of those who have fallen asleep” (1st Cor 15:20). Christians can look at funerals much differently than those without the hope found in Christ because for us, it’s not burial ground, but resurrection ground! Mount Moriah is one of the most significant places because one of the most important events took place and it very much prefigured the coming work of Christ on Calvary. Some believe that Mount Moriah and Golgotha or Calvary were the very same place but is this true? We just don’t have any conclusive evidence of that and we don’t even know the precise location of Calvary because Jerusalem has grown so much. The original place of Calvary and Mount Moriah today are likely somewhere within the city walls of Jerusalem and we will probably never know for sure; at least this side of heaven. The importance of Mount Moriah is associated with what took place there. Abraham was asked to sacrifice his only son, Isaac, and offer him up to God on Mount Moriah. Abraham obeyed God and just before plunging the knife into Isaac, the angel of the Lord stopped him (Gen 22:11-12). Abraham typifies what God the Father sacrificed in His Son, Jesus by offering Isaac but Isaac was spared. Jesus was not. In a doctrinal statement of sorts that foretells the coming Son of God, Isaac asks about the animal to sacrifice and Abraham responds, “God will provide for himself the lamb for a burnt offering, my son” (Gen 22:8). God did just that (John 3:16). This small and seemingly insignificant town called Bethlehem wouldn’t draw much attention except for the fact that this is where Jesus, the Son of God, entered into human flesh to redeem human flesh; at least those who are brought to repentance and faith in Christ. Micah the Prophet foretold this day when he wrote, “But you, O Bethlehem Ephrathah, who are too little to be among the clans of Judah, from you shall come forth for me one who is to be ruler in Israel, whose coming forth is from of old, from ancient days” (Micah 5:2) and this city itself is ancient (Gen 35:19) but the “ancient of days” is obviously Jesus Christ and whom the Apostle John wrote “the Word became flesh and dwelt among us, and we have seen his glory, glory as of the only Son from the Father, full of grace and truth” (John 1:14). When God called Moses to bring out the nation of Israel, it was symbolic of God calling our sinners to leave the world of sin and enter in the Promised Land, which in our case, is the kingdom of God. The main point is that it was God Who brought them out of their Egyptian taskmasters and by His power and for His glory, He sent plagues upon Egypt to force Pharaoh’s hand. Even though Pharaoh kept changing his mind (hardening his heart), God continued to plague Egypt until he took the firstborn of every parent, animal and man alike. Then, the Passover was established as the death passed over Israel but not so with the Egyptians (Ex 12:29). Not long after Israel had left Egypt, Pharaoh changed his mind and came after the Israelites and when he found them, they were trapped by the Red Sea. Surely Pharaoh must have thought he’s got them now but he was unable to reach them because of the Red Sea being directly behind them but God has a purpose for His telling Israel to camp by the Red Sea (Ex 14:1-2) so the Lord says, “I will harden Pharaoh’s heart, and he will pursue them, and I will get glory over Pharaoh and all his host, and the Egyptians shall know that I am the Lord.” And they did so” (Ex 14:4). This epic event was going to be so burned into the nation’s mind that centuries later Stephen the Deacon referred to it as part of his defense of his faith in Christ (Acts 7:36). Finally, “the angel of God who was going before the host of Israel moved and went behind them, and the pillar of cloud moved from before them and stood behind them, coming between the host of Egypt and the host of Israel. And there was the cloud and the darkness. And it lit up the night without one coming near the other all night” (Ex 14:19-20). The rest is history…or His-story. God receives glory for saving a nation that didn’t deserve it just as He pours out like rain His grace and mercy upon us. I pray these have helped you appreciate all that God has done for you…but if God’s never brought you to a time of repentance and you’ve never placed your trust in Christ, then God only has His wrath awaiting you (John 3:36b), right after death (Heb 9:27) or at the Lord’s return to judge the world in righteousness…and at which time, the Lord will take to Himself the children of God and He will be in their presence for all time (Rev 21:3, 22:4). Previous post: What Is The Guff?